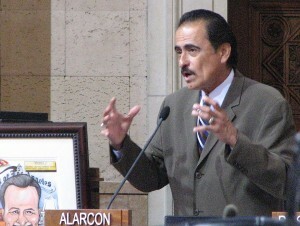 Former Los Angeles City Councilmember Richard Alarcon recently issued the following message addressed to Nancy Oda of the Tuna Canyon Detention Station Coalition and to the entire Japanese American community. One of his last acts before leaving office last year was securing historic-cultural landmark status for the Tuna Canyon site in Tujunga. Alarcon is currently serving 51 days of house arrest after being convicted of three counts of fraudulent voting and one count of perjury by declaration, and being acquitted of a dozen other felony counts. He is appealing his conviction, saying that contrary to prosecutors’ claims, he did live in a Panorama City home within his council district. As a former high school history teacher it was easy to support the Tuna Canyon cause because I believe we must value our past, as ugly as it may sometimes be. When the story is bad, we must reflect on it to avoid similar events in the future. But, more importantly to me, the Japanese community is involved in my entire life. I have good memories of playing with John Yamamoto after school at Fernangeles Elementary for five years. I hit my first home run at San Val Little League off of Kevin Shibuya and took judo at the Japanese American Community Center. I even babysat Sam Wada’s kids, who were our neighbors. Growing up at my dad’s upholstery shop, I spent a lot of time with Ted Shibuya’s little brother, who was mentally challenged. My dad would pay him cash for little jobs he could do like deliveries and “stripping” furniture. My dad served in the Pacific during World War II, but when he came home, he built a house in the barrio of Orcasitas immediately adjacent to the Japanese community. Harry Nakada’s home and about 20 other Japanese families were right behind my dad’s house. When I was student body president at Poly High School, several student council members came from that community. My sister liked to go to the dances at the Japanese Community Center because she liked a boy named Isau who was a “box boy” at the grocery store my mom worked at. Of course, you know that it was Rose Ochi who gave me a job in Mayor Bradley’s Office. That propelled me into my political career. You probably don’t know that most recently Rose went to court numerous times to provide support and encouragement to my wife and me. For several years, Alvin Kusamoto was my chief of staff while at the same time serving as the highest-ranking Japanese American in the U.S. Marines. Colonel Kusamoto developed and implemented the democratic election process when serving us brilliantly in Iraq. I am very proud of his service in Iraq and in my community. When people from the Japanese community thank me for the work that I did to preserve the memory of Tuna Canyon internment or the numerous projects I worked on with the leaders of the Japanese American Community Center, I am somewhat embarrassed. I am not Issei, Nisei, Sansei or Yonsei, but the Japanese community IS my community. As an elected official, I am thankful for having the opportunity to serve my community. As a human being, it is I who thank the Japanese community for enriching my life with many “gifts” of life experience and also allowing me to come inside to serve you. I only hope I have served you well.